Are you looking for a way to lose stubborn fat and sculpt your body without invasive surgical procedures? Try SculpSure®, the first FDA-approved laser procedure for safe, effective fat destruction. SculpSure is the newest generation technology in non-invasive body contouring and gaining in popularity every day. This treatment has a patient satisfaction rate of over 90% . "SculpSure! - San Francisco, CA - Very attentive! Sat with me almost the whole treatment!" "Met with Dr Gray about the Sculpsure procedure along with info from his staff--- Cherise helped explain the procedure - Ashley was sweet in setting up the appointment and sharing her own experience and even emailed us her before and after pics to share--Lalena helped keep the procedure painless:) Friendly good looking staff- all professional and just very sweet. I can't wait to see results in about 12 weeks! Thank you staff for making the entire process easy.My colleague and I did the 25min procedure on the spot. Will go back and do another section on my body after the results are in:))"
Contrary to what is typically assumed, losing weight does not mean removing fat cells. During traditional weight loss through diet and exercise, the body’s fat cells shrink but stay in the body. There is no way to do this in a targeted manner, so these weight-loss methods may not result in the fat reduction that we want. Stubborn fat deposits, like the ones often found in the love handles, flanks, and abdomen, resist these methods. SculpSure, on the other hand, is a way to specifically and permanently remove fat cells from these stubborn areas of the body, resulting in targeted fat reduction. Up to 24% of the fat cells in the treatment area are removed. Once a fat cell is disabled and filtered out of the body through this method, new fat cells do not replace it; this keeps the area slim and fit. Unlike liposuction or freezing fat, SculpSure is a selective hyperthermic lipolysis process. It will not harm the surrounding tissue. SculpSure uses a 1060 nm wavelength laser, which affects fat cells without injuring the dermis. This treatment is very versatile, thanks to the design of its applicators, and can be used safely on all skin types and in a variety of treatment areas. SculpSure is a convenient process. In only 25 minutes, multiple trouble areas of the body can be treated. Because SculpSure is non-surgical, no anesthesia will be required for the treatment. Instead, cooling plates are placed on the target area in order to keep the skin cool and comfortable. The SculpSure applicator then targets the fat region with concentrated heat, bringing the fat cells to a temperature between 42°C and 47°C. This disrupts the unwanted fat cells in a process called controlled hyperthermic lipolysis. In order to help the results blend naturally, the heat from this process spreads around the applicator slightly. This is known as thermal spread. Freezing fat does not have thermal spread and therefore is prone to “step-offs” and irregularities. As the SculpSure treatment is occurring, the patient is awake and comfortable. Patients typically feel occasional mild warming and tingling sensations. Once the patient’s SculpSure treatment is complete, they will be free to return to their normal daily schedule, including their workday. This makes it an ideal procedure for busy professionals on their lunch breaks. In the months following the treatment, the body is gradually filtering out the disrupted fat cells. As this occurs, patients see a volume reduction in their trouble areas. After six weeks, partial results are often evident but two treatments per area are recommended. After twelve weeks, the removal of the cells is usually complete and the full results are achieved. Patients will see, on average, 24% fat reduction with just 1 treatment of SculpSure. If more fat reduction is desired, this can be attained with the help of additional sessions. We recommend treating all areas with two sessions of SculpSure. SculpSure is a non-invasive treatment that reduces fat an average of 24% in 25 minutes. Are the results of SculpSure permanent? Yes. SculpSure permanently reduces fat by destroying the treated fat cells. How much fat is destroyed with a Sculpsure treatment? In the studies leading to FDA approval, one SculpSure treatment reduced the treated area an average of 24%. One SculpSure treatment gives an average of 24% permanent fat reduction. Can I do more than one SculpSure treatment in the same day? Yes; the SculpSure has four applicators that are about the size of a loaf of bread when placed side-by-side. The four applicators are the equivalent to one treatment. If someone wants to treat many different areas of the body they can be treated sequentially during the visit. Each four-pack counts as one treatment and takes approximately 25 minutes. Can I do more than one SculpSure treatment in the same area to get more of a result? Yes. 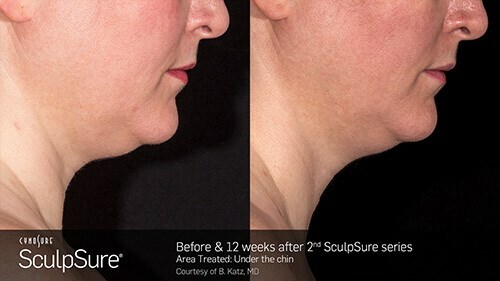 A patient can do their second SculpSure treatment as early as 6 weeks after the initial treatment. With a second treatment in the same area, the patient can expect an additional 24% fat reduction. How long does a SculpSure treatment take? Can I do it in my lunch hour? 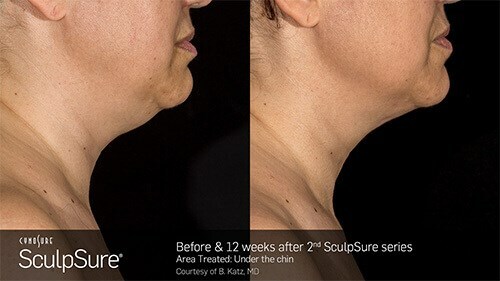 A SculpSure treatment is fast. It takes only 25 minutes. 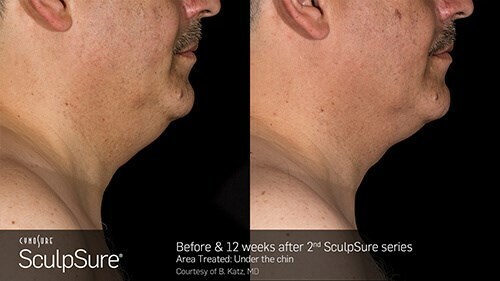 Yes, you could do a SculpSure treatment in your lunch hour. When will I see the results of my SculpSure treatment? It takes some time for the destroyed fat cells to be processed by the body and for mild swelling to resolve. Generally, it is thought to take 3 months for your results to be complete. People say, however, that they already notice a difference at 4-6 weeks. Will I be swollen after my SculpSure treatment? Patients are mildly swollen after a SculpSure treatment. They can still fit into their regular clothing and go right back to working out. How much downtime is there after a SculpSure treatment? 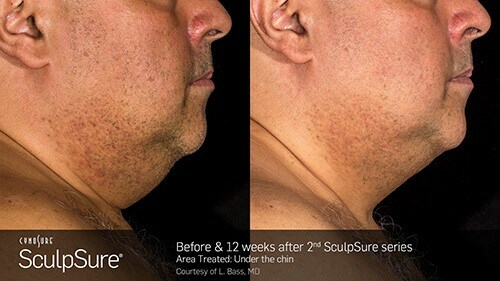 There is absolutely no downtime following a SculpSure treatment. You can go right back to work, the gym, or yoga class. There is no restriction on activity following a SculpSure treatment. Will I be sore after a SculpSure treatment? Some patients do experience soreness following a SculpSure treatment, similar to that following a workout. Will a SculpSure treatment affect my skin or underlying muscle? No, SculpSure does not damage skin, nerves, or muscle. The laser specifically targets fat cells only. Is the SculpSure treatment painful when it is performed? Most patients say they feel warmth, tightness, and a slight tingle during their SculpSure treatment, sometimes with a bit of discomfort but not painful. The energy level of the laser can be adjusted so that the treatment is tolerable. According to the studies leading to the FDA approval, patients were asked to report their level of comfort during the treatment. Patients who reported the end point of tolerable warmth and tightness saw an average of 24% permanent fat reduction. In other words, we want you to feel the treatment, but we don’t want you to be in pain! Is SculpSure safe for all ethnicities and skin complexions? Yes, the SculpSure treatment is safe for both lighter and darker skin tones. There are no skin changes. There is no skin injury. 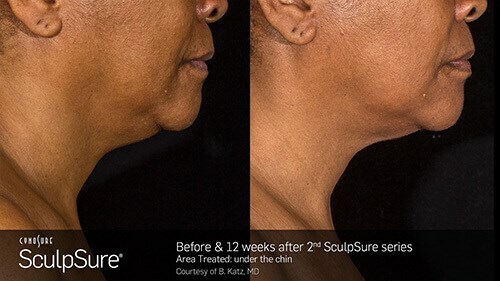 SculpSure is safe for all skin types. It took the Cynosure company 8 years to find and perfect a laser that destroyed fat cells and left all other tissues alone. They found that the 1060 nanometer wavelength laser was perfect for that purpose. This 1060nm laser reacts with fat cells only, heats them, and destroys them. It bypasses skin and muscle cells so there is no damage to the skin or underlying structures. Also, the laser does not penetrate deep enough to even affect the deeper structures. What happens to the fat cells treated with SculpSure? The fat cells treated with SculpSure are heated. They then go through a process called apoptosis where they gradually die out. The dead cells rupture, leaving a cell membrane and triglycerides which are then absorbed by the lymphatic system. The lymphatic system then processes the cellular waste as it would any type of bodily waste. Staying hydrated helps this process along. Will my triglyceride level increase following a SculpSure treatment? No. Studies have shown no increase in triglyceride levels following a SculpSure treatment. Will my body make new fat cells after a SculpSure treatment destroys 24% of the treated fat cells? Your body will not make new fat cells after a SculpSure treatment. The number of fat cells that a person has is set and permanent early in life. Adults don’t make new fat cells. So, your body will not replace the fat cells destroyed by SculpSure. Can I still gain weight after a SculpSure treatment? Yes. If a person takes in too many calories, it causes fat cells to increase in size. If you lose weight, your fat cells shrink. Fat cells do not increase or decrease in number. Is SculpSure better than the freezing technique (cryolipolysis) for fat reduction? SculpSure is not painful- a treatment is meant to be comfortable and tolerable. Post treatment people are not sore and resume their regular activities immediately. SculpSure only treats the fat. There is no damage to skin, nerves, or muscle as reported with the freezing technique. What is the cost of SculpSure? SculpSure is much less expensive than liposuction surgery and has no downtime with minimal risk. SculpSure costs about the same as cryolipolysis (freezing fat) but does not have the complications of denting, irregularities, step-offs, skin damage, pain, or chronic nerve pain. Yes, SculpSure was FDA approved for permanent fat reduction near the end of 2015. The FDA clearance studies looked at fat reduction of the abdomen, flanks, and hips. They found an average of 24% reduction following one 25 minute treatment, with virtually zero side-effects. The approval process was quicker than expected because of the safety and effectiveness. 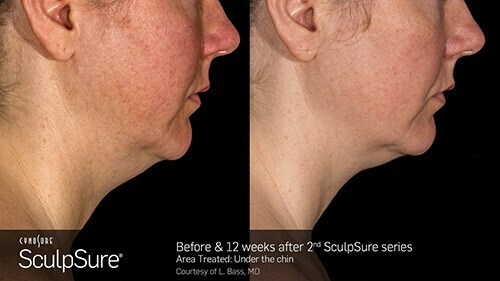 Does SculpSure improve the skin? Yes; SculpSure was found to tighten the skin during a fat reduction treatment. It may work by tightening the collagen bonds between the skin and underlying muscle. There is no recovery from this skin tightening effect. Are there any new treatments planned for SculpSure in the future? 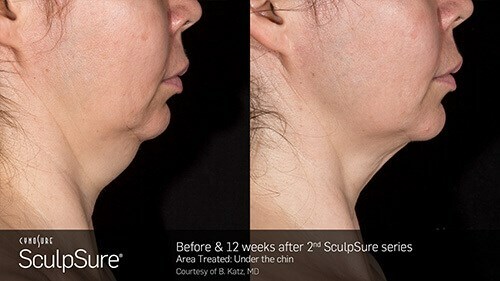 SculpSure will have other applicators available in the near future for specific treatment areas such as the submental region, or the area under the chin. Can you treat problem areas other than the abdomen, flanks, and hips with SculpSure? Yes, we have successfully treated many areas of the body with SculpSure and the results have been equally impressive. Areas that we have successfully treated include the upper arms, anterior and lateral chest (especially in men), bra roll area, inner thighs, outer thighs, medial knee, upper knees, and lower legs such as the calves.